The Moroccan clay mask is made from 100% Rhassoul (also called Ghassoul) which comes from North Eastern Morocco, mined beneath the Atlas mountains. This clay has been used for over 1400 years as a skin conditioner. 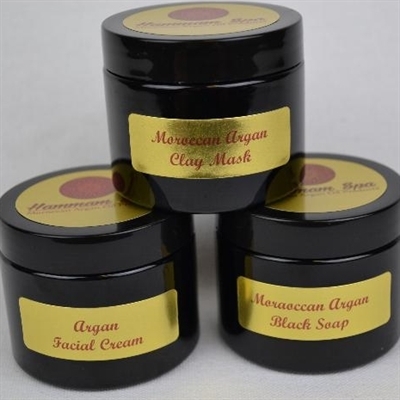 It is renowned for its superior ability to absorb impurities from the skin, unblock pores, and provide beneficial minerals that help to soften and clarify skin..
Use the clay with the included Argan black soap and Argan facial cream then you are sure to enjoy this complete facial kit!